The Micie bridal boutique in Tokyo, Japan (Aoyama and Motoazabu) makes the prettiest gowns that range from simple and chic to glamorous. I picked some of the gowns pictured below for their intricate detailing, particularly on the bodice and back. Feast your eyes on the following wedding dress eye candy. 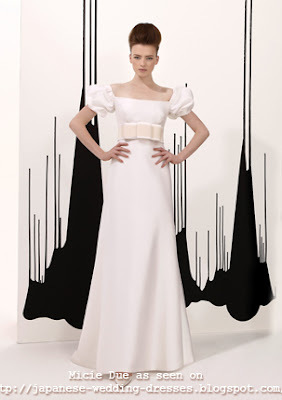 The puffed sleeves and belt give this classic gown a retro feel. I love the interesting and unexpected back detailing on these gowns. Frothy layers at the back give this gown an element of fantasy. 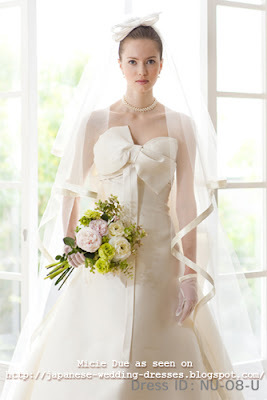 A playful bow gives this strapless gown a pretty focal point. The interesting draping on the bodice gives this strapless A-line gown a unique twist. Fancy detailing at the back gives this gown a playful element. A gown that's a simple bustier in the front with a surprise at the back.